New challenges need new solutions. A control solution for industry 4.0 must be flexible, deliver consistent data from the field to the cloud level, enable distribution of intelligence and master the complexity in engineering. nxtControl already offers a path-breaking software solution meeting these challenges. With the nxt4EVAL the company is offering a hardware perfectly adjusted to the solution. This hardware is designated for evaluation purpose only. 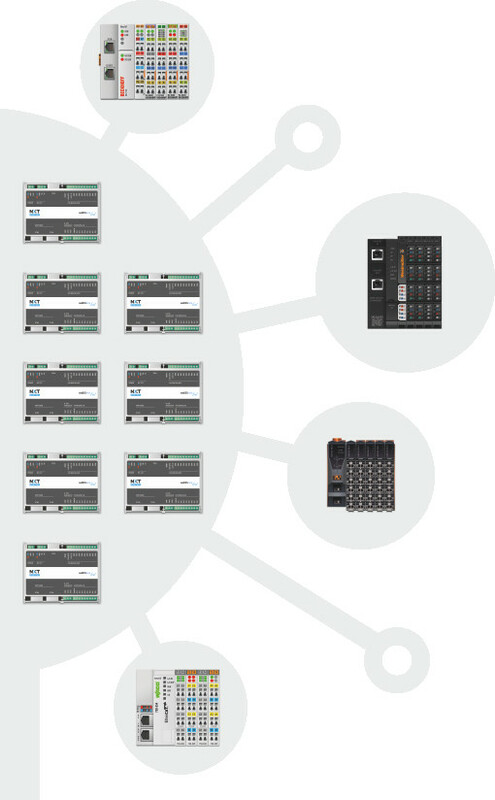 I/O systems from different suppliers can be connected via the integrated EtherCAT interface. 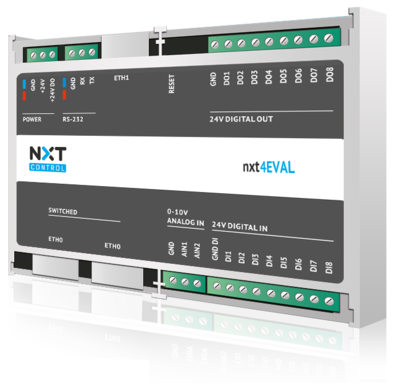 The nxt4EVAL is a flexible and cost-efficient solution for applications with distributed intelligence / control logic. Applications using nxt4EVALs as well as together with other control hardware are programmed with the nxtONE Studio. This is the most efficient solution for facilities with distributed control, the need to integrate seamlessly HMI and/or SCADA functions and the request to provide consistent data form the field to the cloud-level. Don’t be afraid – it’s very simple! Whenever a new technology is entering a market there is restraint initially. Many hesitate to drop something familiar and try something new instead. We want to decrease this inhibition level by offering the nxt4EVAL-set. A simple and favourable possibility to get in touch with the latest control technology according to IEC 61499. With that, an automation application with distributed control and seamlessly integrated HMI / SCADA can be tested and verified. The nxt4EVAL and nxt4EVAL-set are designed for evaluation and as a training environment. The system is not approved for productive usage. Programs loaded on nxt4EVAL run for 8 hours. After that, the loaded program stops and is deleted from the device. In order to restart it, the program has to be loaded into the nxt4EVALagain. 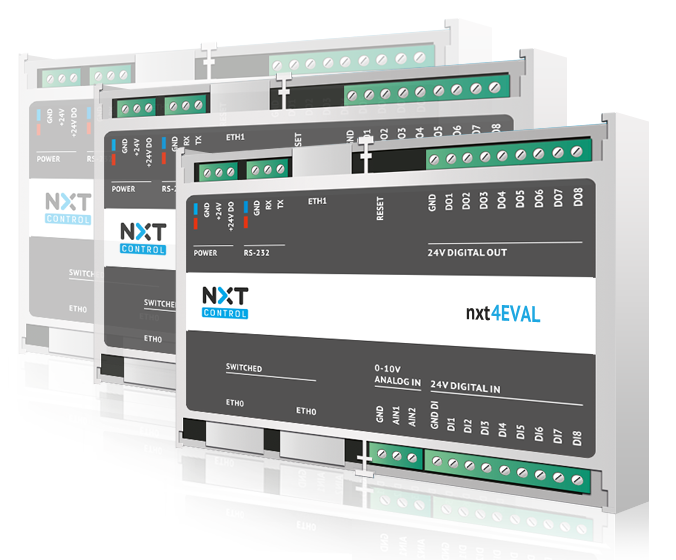 The nxt4EVAL-set is an environment for training and qualification. Sample projects and tutorials show all the functionality and give advice how to create a distributed and integrated automation solution. 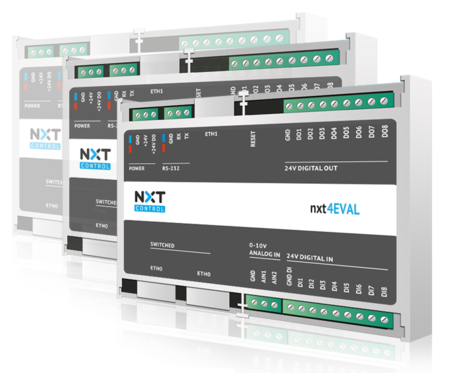 The set includes 3 pieces of nxt4EVAL controllers, which are provided with an IEC 61499 runtime system. Programming and configuration is done with the engineering tool nxtONE. Automation projects may be created from scratch or the sample projects can be analysed and recreated. The engineering tool is provided with its full set of functions to program function blocks, IEC 61499 logic, HMI, system configuration, device management, test and commissioning. A software library for nxt4EVAL and application libraries for the sample projects are included as well.